It’s exactly how it sounds. When manufactured your garment is generally a few pieces of fabric stitched and sewn together right on the seams. An expert tailor would slowly ensure the quality of the stitches before placing it through a machine to put in a surge stitch. At Cheung’s Tailor Alterations there are usually projects too large or any projects too simple. So if you’ve got a new shirt and the seam popped open, a buckle on a bag that comes loose or a small hole right on the seam of the fabric bring it in an see what Cheung’s Tailor can do to help you repair it. Please note some things if not most don’t tear nicely on a seam. Generally this would include clothing that is too tight or fabric becoming too old and the clothing tears along with it. In situations like this we would have to remove a small part of fabric as allowable to keep it not from fraying into the future. Some seams are thicker than other mainly, thicker belt loops and also leather jackets come on in for a free consultation on what we can help you with on this simple sewing repair. So if you find yourself caught on something, velcro catching onto your pant legs, dog biting onto your shirt, or something crazy. 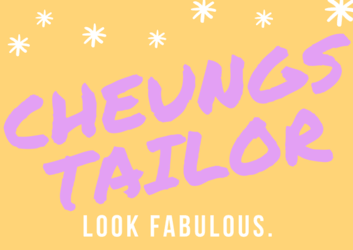 Cheung’s Tailor is here to sew it right up!